» RG3 Watch: So … Seattle? Or Maybe Kansas City? 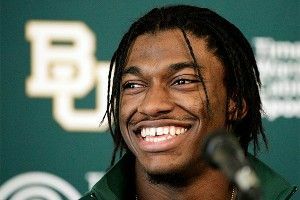 RG3 Watch: So … Seattle? Or Maybe Kansas City? Where will you land, Robert III of House Griffin? That’s been the question on everyone’s minds since Rams COO Kevin “Scream-Off” Demoff announced his team would be willing to trade the no. 2 pick in the draft for the right price. They already gots Bradford, yo, and to hear them tell it, Slick Sammy works alone. But who’s gonna get him? Here at the Gryffindor Watch, we’ll track it so you can keep on sneaking office doughnuts and hanging rubber bands on your ears until 5 p.m. comes to save your soul until the morning. The Guardian is reporting that there are only five likely suitors for the Rams: Browns, Redskins, Dolphins, Seahawks, and Chiefs. My older brother Chris Ryan covered the first three, along with the Eagles, in Tuesday’s post. But what about the ‘Hawks and the ‘Iefs? According to the News-Tribune, Pete Carroll was positively agush about Griffin four days ago. “I’d trade anyone in my own family for him, alive or dead,” Carroll said. “He’ll be able to do whatever is asked of him,” Carroll said. “He’s got that kind of range of ability. Now, it’s a different system he’s coming out of, much different than what we typically see with the big-time pocket passing quarterbacks. That’s all I got. Tomorrow on the Gryffindor Watch, I think there’s going to be something huge, involving Philip Rivers, the New York Yankees, and former President Richard Nixon. Stay tuned, or your friends will think you’re lame.